Early Earth was a hot, gaseous, dusty and dynamic planet with an atmosphere and an ocean. Then its surface cooled and stabilized enough for clouds, landmasses and early life to form about four billion years ago, during what's called the isotopic age of rocks, or the Archean Period. Atmospheric chemical byproducts from that time traveled through the air and deposited inside the planet's oldest rock, recording life's earliest activities like photosynthesis and oxygen production. Sulfur isotopes can serve as tracers of atmospheric oxygen, and new data collected from the present-day atmosphere in China by an international team of researchers, led by the University of California San Diego, indicate remarkable similarity to the isotopic footprint found in ancient rocks. This opens up new interpretations of the Archean Period's sulfur isotope sedimentary signature—a proxy for the origins and evolution of atmospheric oxygen and early life on Earth. The study led by Mark Thiemens, distinguished professor of chemistry and biochemistry; Mang Lin, a recent Ph.D. graduate from UC San Diego and Yanan Shen, a professor at the University of Science and Technology of China, is published in the Proceedings of the National Academy of Sciences. Their research involved taking current sulfate aerosol measurements of five sulfur isotopes from samples of atmospheric aerosols collected at Mount Wuyi, a remote site in China, and Guangzhou, a megacity. The isotope measurements, performed at UC San Diego and the University of Science and Technology of China resolved the chemical mechanisms and transport of atmospheric aerosols at a new scientific level. "By using the stable and radioactive isotopes, we were able to zero in on new sources of the isotope effect today and better define the early atmosphere and evolution of life," Thiemens said. Thiemens explained that in the Archean atmosphere the oxygen and ozone levels were low enough that ultraviolet (UV) light penetrated the Earth's surface and dissociated sulfur dioxide, forensically producing a specific isotopic pattern. The study reveals that stable sulfur isotope compositions are anomalous and mimic measurements of ancient sulfur isotopes. 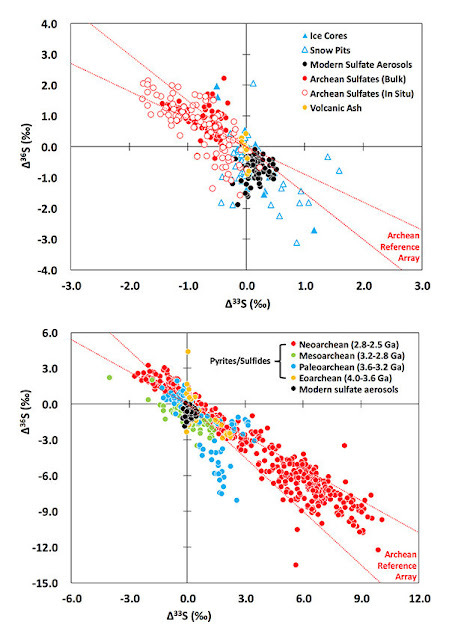 Figures depict similarity of signatures in modern atmospheric sulfates and geological records. Additionally, Thiemens explained that the photo destruction of sulfur dioxide by UV light in the early Earth's atmosphere provides a measure of oxygen levels. He said that the levels of oxygen and ozone levels of early Earth were sufficiently low so that UV light reached the Earth's surface, dissociating the sulfur dioxide and producing the anomalies. "A surprise from Mang Lin's measurements was that with combined stratospheric tracer Sulfur-35 (a radioactive sulfur isotope), and another stable isotope of stable sulfur, there is no correlation," said Thiemens. "It was demonstrated by correlation with known combustion products that the processes of biomass burning and combustion produce this specific isotope anomaly, which had not been known before, providing new interpretation of early Earth chemistry and suggesting there are other processes that occur in the early Earth, such as volcanoes, that could produce the anomalies along with UV light photolysis." According to Thiemens, this study provides "yet another quiver in the arrow" of parsing out processes that occur in the early Earth and defining both life's origin and change.